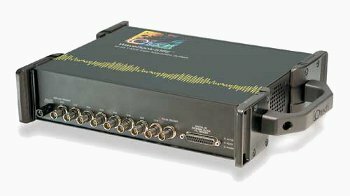 The IOtech brand WaveBook/516E digitizer from Firetail DAQ offers multi-channel waveform acquisition and analysis for portable or laboratory applications. The WaveBook includes 8 built-in channels expandable up to 72 channels. WaveView software is included with the WaveBook, providing all set-up, data acquisition, real-time display, and storage to disk without having to program. WaveView supports up to 72 channels of strain, voltage, or sound/vibration inputs. For applications beyond 72 channels, or for custom applications, comprehensive drivers are included for DASYLab®, NI LabVIEW™, Visual C++®, Visual C#®, Visual Basic®, and Visual Basic .NET®. The WaveBook can be expanded to up to 72 channels of voltage, accelerometer, microphone, strain gage, thermocouple, position encoder, frequency, high voltage, and other signal types. For applications beyond 72 channels, up to four WaveBooks can be combined within one measurement system, for a total capacity of 288 channels. You can also add up to 854 thermocouples, without consuming measurement bandwidth of the WaveBooks, using the WBK40 Series, and DBK90 signal conditioning options. See table below for conditioning options.